The primary function of the thyroid is production of the hormones T3, T4 and Calcitonin. Up to 80% of the T4 is converted to T3 by organs such as the liver, kidney and spleen. T3 is several times more powerful than T4, which is largely a prohormone. 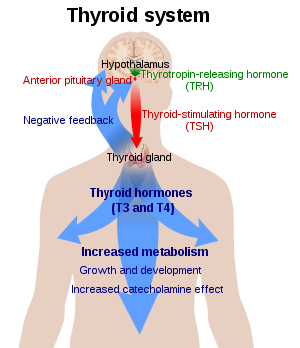 The functions of thyroid glands are due to its products- T3 and T4. TSH is the hormone produced by Pituitary gland in brain. This TSH affects production of T3 and T4 from Thyroid gland. How Thyroid Hormones are formed? Iodine sequestration- Iodine is essential for proper thyroid function. Iodide is taken up by cells of thyroid gland. This iodide is then oxidized to iodine and attached to a protein Thyroglobulin which is produced by these thyroid cells. Thyroxine (T4) is synthesized by the follicular cells from the Tyrosine residues of this Thyroglobulin (Tg). TSH causes stimulation of follicular cells to form Thyroxine . In the blood, T4 and T3 are partially bound to proteins like Thyroxine-binding Globulin (TBG), Transthyretin, and Albumin. Only a very small fraction of the circulating hormone is free (unbound) – T4 0.03% and T3 0.3%. Only the free fraction has hormonal activity. The production of T3 and T4 is primarily regulated by thyroid-stimulating hormone (TSH) which together form a negative feedback loop: TSH production is suppressed when the free T4 levels are high.